We make this casserole at home on our pig farm in Yorkshire. It may be simple and homely, but it is no less delicious for that. 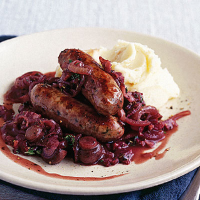 Serve it with creamy mash for a comforting winter dinner. Preheat the oven to 150°C/gas 3. In a casserole, brown the sausages in the oil for 5 minutes. Once brown, remove them to a plate, leaving all the juices in the pan. Next, brown the bacon and onion for 5 minutes. Sprinkle in the flour and slowly stir in the wine. Add all the remaining ingredients, bring to the boil, then cover and transfer to the oven for 45 minutes.